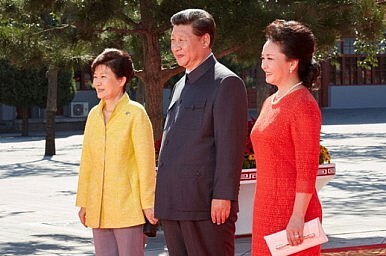 Is China Tilting Toward South Korea? The big parade in Beijing symbolized how the two Koreas’ relations with China have diverged recently. As an illustration of how the two Koreas’ relations with China have diverged in recent years, the seating arrangement at Beijing’s massive military parade on Wednesday was apt. South Korean President Park Geun-hye watched the parade, which celebrated the defeat of Japan in World War II, while seated beside the wife of Chinese President Xi Jinping. Xi himself sat on the other side of the first lady. North Korean leader Kim Jong-un, meanwhile, was nowhere to be seen, having declined an invitation to the celebrations. In his stead, Choe Ryong-hae, secretary of the Central Committee of North Korea’s ruling Workers’ Party, sat at the end of the row of foreign dignitaries, which also included Russian President Vladimir Putin. The image was a telling reminder of how China-North Korea ties have soured since Kim came to power in 2011, while China-South Korea relations have warmed since the inauguration of Park in 2013. Although China is routinely referred to as North Korea’s main ally, Xi has yet to meet with Kim. Park, on the other hand, has met with Xi personally on six occasions. For Beijing, the benefits of closer ties with Seoul are obvious; it remains South Korea’s largest trade partner. At the same time, Beijing’s traditional alliance with Pyongyang has come under particular strain since the latter disregarded Chinese objections and carried out its third nuclear test in 2013. “Sino-DPRK relations probably can’t get worse; I think it is likely they will improve rather than deteriorate,” Scott Synder, director of the program on U.S.-Korea policy at the Council on Foreign Relations, told The Diplomat. The two Koreas’ role reversal of sorts isn’t alone in challenging the traditional diplomatic order. South Korea this week once again found itself attempting to balance its increasingly important relationship with China with its alliance with the United States. Park reportedly ignored U.S. objections in attending the events in Beijing. In Synder’s view, Park’s maneuvering is in line with Seoul’s usual balancing act. “This is not a zero-sum moment for Korea in the U.S./PRC [People’s Republic of China] context, or even much of a turning point,” he said. Park's talk with Xi focused on North Korea, but historical issues played a major role as well.